It wasn’t that long ago that I finally, after sitting on a project for 3 years, launched my very first product. 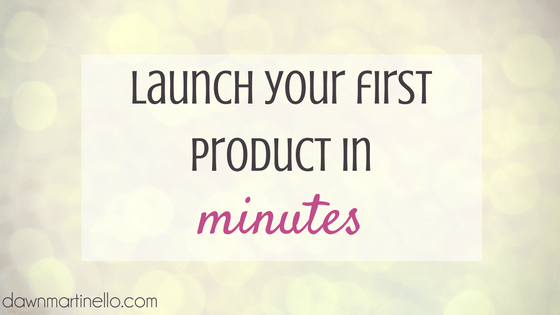 Once I had the actual product laid out, I launched that baby within 30 minutes and it cost me about $5. Here’s the lesson: launching something doesn’t always mean you have to have a huge list, a spectacular $1000 product or take you 6 weeks to plan out. If you don’t have a shopping cart or delivery system, get yourself an eJunkie account. There’s a free trial, test it out and get your product in there. It connects with your PayPal account so once it’s in there, all you have to do is upload your file and pop the buy it button on your site. There, you’re done. No, I’m serious. That’s the only thing that you need to do to get a product out in front of your audience. Is there bigger and better ways to do this? Absolutely. But what’s more important is that you just launched your very first product. You have a little something-something out there in the world. Check out this super quick video on getting a product into eJunkie.